I have also seen many posts on this. I understand what the line is used for legally. The Kármán plane or a plane that is most efficient at the line regardless of the shape seems not to have a specific purpose but maybe I am wrong? For a number of reasons human reasons like giving someone astronaut wings, winning the X prize or for rules around national boundaries there is a need for a hard divider between 'space' and 'atmosphere' and the calculations for the Karman line provide a convenient mathematical way to do that. The fact that the Karman line of 100km used for most purposes is actually some distance from the ~85km point that Karman calculated is possibly telling in terms of how meaningful the value is other than it being a round number higher than aircraft can fly and lower than space craft can sensibly sustain orbit. So the Karman line is a legal construct for space law and administration, and almost meaningless for actual engineering. It's a pretty abstract boundary, with gradual changes either side, of no practical use. No "line" has never[sic] found a practical use in engineering, and it has been misinterpreted by lawyers as having some physical significance it does not in fact have. Not the answer you're looking for? 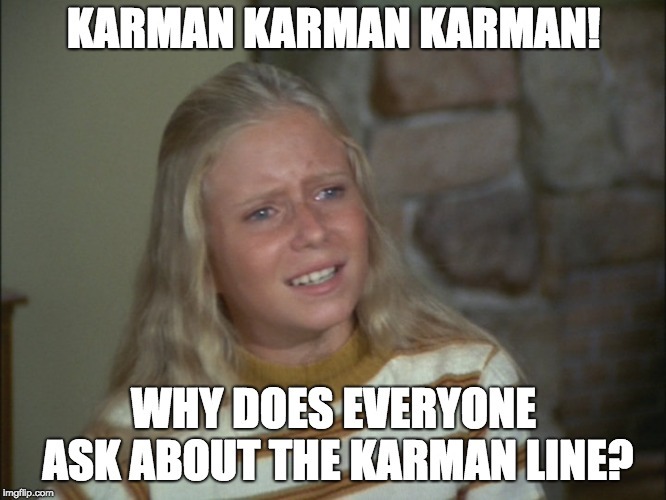 Browse other questions tagged karman-line or ask your own question. What is the most aerodynamic Satellite? What is the practical use of the Karman line? How did the X-15 control attitude above the Kármán line? Did the Soviet Union put an unmanned satellite in “very low orbit”above the Kármán line which used aerodynamic attitude control? At what conference the “von Kármán line” arose and was discussed for the first time? Are there calculations regarding the Kármán line in the Theodore von Kármán collection?